Diablo is a cooking term which means “to make it really hot”, similar to devilled where a dish is infused with hot ingredients such as chillies, pepper and mustard. 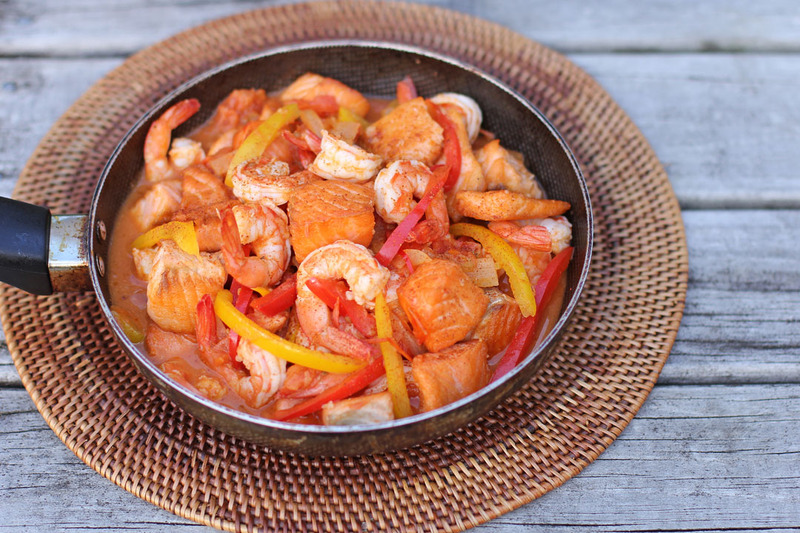 This is most probably of Mexican origin but not 100% sure, I just assumed as I saw this dish on Mexican restaurants, also the ingredients on this dish like shrimps and chillies are popular in Mexico. The most common recipe for this type of dish is Shrimp Diablo where it can be skewered, placed on pasta or paired with rice. For this recipe I will add Salmon as its mild and creamy flavours would be a great contrast to this great dish. Also I had added some capsicums to have a different texture to the dish. This is for people who loves hot and spicy dishes and not for the fainthearted, but if you want to serve it to those who does not like spicy dishes you can reduce the amount cayenne pepper and add more of the tomatoes. Serve this dish with rice and finish it with something creamy and cold like an ice cream, yoghurt or sorbet. Season shrimps and salmon with salt and freshly ground black pepper. In a heavy pan, add oil and pan sear salmon pieces in high heat, once seared on all sides remove then set aside. Do the same thing with shrimps, sear in high heat and once seared on both sides remove then set aside. Using the same pan, still in high heat add garlic, onions and tomatoes, stir until tomatoes are soft. Add wine and brandy to deglaze. Mix in cayenne and tomato paste then bring to a boil. Add red capsicum, yellow capsicum and seared shrimps. Simmer for 2 minutes. Add the salmon pieces, mix gently then season it with salt and freshly ground black pepper. 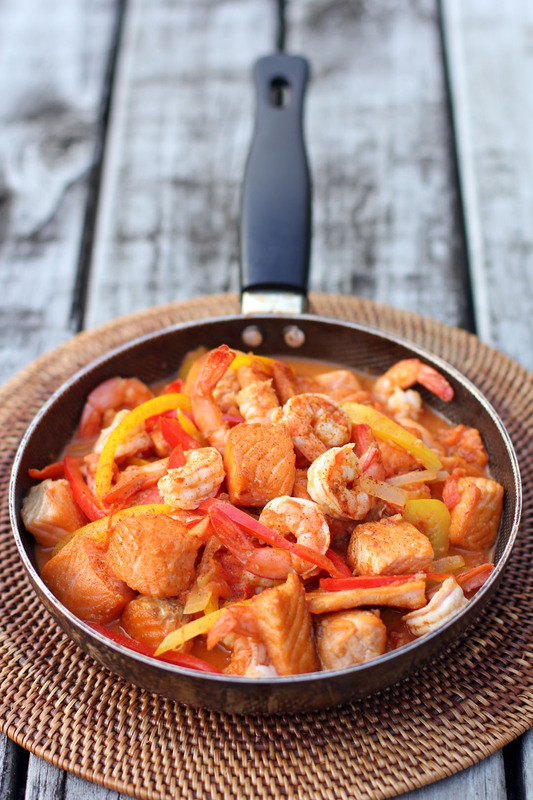 This look so good, and I love the combination of fish with shrimp…like the spiciness of this dish. Looks very good I have to say! Love the idea of adding salmon to this! Genius, truly. Thanks for this. What a great combination of flavors! Never have had salmon in a diablo. Sounds delicious! It looks and sounds devilishly good!